Chiefs sit only a single point ahead of rivals Tri-City after splitting two games with Portland, picking up a point against Winterhawks. SPOKANE, Wash. — After splitting a pair of games with second place Portland last week and only gaining one point on the Winterhawks in the standings, the Chiefs are pretty much having to come to the reality that they will finish no higher than 3rd in the U.S. Division this season. They also know the Tri City Americans are right on their heels for third, and could easily overtake Spokane in the standings unless the Chiefs find some consistency to their game and stop playing .500 hockey. Spokane entered this week just one point ahead of the Americans in the standings as the Chiefs played three games outside the U.S. as they took on Kelowna and Victoria from the B.C. Division and Kootenay from the Central. Spokane started the week without defenseman Noah King, who attended a family funeral, but the club did welcome back defenseman Matt Leduc from the injured list. The Chiefs also defenseman Ty Smith back in the lineup after he took a head first hit into the boards at Portland on Saturday. 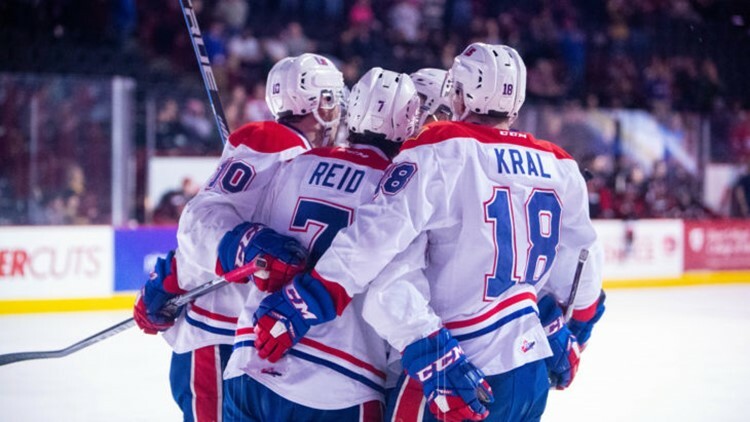 First up were the Kelowna Rockets on Wednesday, whom the Chiefs had shut out 4-0 the previous Friday. Goalie Reece Klassen, who pitched his first shutout in his career in the win, was named the WHL's goalie of the week for his efforts. The team went back to Klassen Wednesday, but it took the Rockets just 3:38 to score in grabbing an early 1-0 lead. Spokane bounced right back as Luke Toporowski scored back to back goals at 5:02 and again on the power play at 15:08 on a tip of a Jake McGrew shot to give the Chiefs a 2-1 lead after one. Kelowna scored on the power play just over 2 minutes into the second to tie the game at two, but Connor Gabruch scored his first career goal at 4:15 to put the Chiefs back up 3-2. Jaret Anderson-Dolan then fired home his 6th of the season midway through the period to hand Spokane a 4-2 lead after two. Kelowna pulled back within one on a power play goal just 23 seconds into the third to cut the margin to 4-3. McGrew put the lead back to 2 with his 22nd of the season on a tip of a Matt Leduc shot at 2:08 to make it 5-3 Chiefs. Kelowna pulled back within one on a short handed goal just over 7 minutes into the third to pull within 5-4, but the Chiefs clamped down from there with some timely blocked shots as Spokane got their first road win since January 5th with the 5-4 decision. The victory pulled the Chiefs 3 points ahead of idle Tri City for 3rd in the division and within 9 points of second place Portland. Spokane now headed home to open a 3 game home stand as they hosted Victoria for the first time at the Arena this season. The two teams split their two games in Victoria in November, and the Royals were coming off a 5-3 win over Seattle at home on Wednesday. The Chiefs welcomed back defenseman Noah King to the lineup on Friday, as for just the 3rd time this season, the team had their full lineup intact. Spokane went back to Bailey Brkin in net, and the Chiefs gave the 19 year old netminder a boost when Connor Gabruch scored for the second straight game with a highlight reel goal 6:21 into the game to give Spokane a 1-0 lead. The Royals then scored two goals in just 28 seconds midway through the period, the second tally going off Chiefs forward Jack Finley net front as Victoria took the lead at 2-1. Just 1:38 later, Chiefs forward Jaret Anderson-Dolan scored his 100th career goal on the power play to pull Spokane back even at 2-2. The Royals scored on a power play of their own at 16:33 to re-take the lead at 3-2, but just when it looked like Victoria would take that advantage to the second, Luc Smith back handed a rebound from Reid at 17:45 to pull the Chiefs even at 3-3 after the first. After a wild first period offensively in the first, the two teams settled in defensively in the second. The Chiefs managed the only goal of the period when Ethan McIndoe scored on a rebound midway through the stanza to give Spokane a 4-3 lead after two. In the third, Victoria appeared to tie the game a little over 4 minutes in, but after a review, the goal was disallowed due to the puck being kicked in the net from the crease. Spokane then went on the power play less than 2 minutes later and converted with one second left on the man advantage when Jake McGrew knocked in the puck from mid-air. The Chiefs would then score two more consecutive power play goals from McIndoe and Reid to go up 7-3, and then Luke Toporowski capped the 4 goal third with a short handed marker in the final 2 minutes to wrap up an 8-3 victory. Spokane went 4-8 on the power play, matching a season high for power play goals in a game and have now scored a league high 60 goals on the power play this season. The Chiefs also kept 3 points up on Tri City for 3rd in the U.S., while staying 9 points back of Portland, as both clubs also won on Friday. Spokane hoped to close out a perfect week the next night as they hosted the Kootenay Ice at the Spokane Arena for the final time this season. It's not just the final time this year, but the final time ever. Next season, the Ice will move to Winnipeg and into the Eastern Division of the WHL. With that move, Spokane will go back to playing the Ice only one time a season, as compared to the 5 times the two have played over the past couple of decades. Kootenay is the second closest rival to Spokane, and the trip to Cranbrook is closer for the Chiefs than Seattle, Everett or Portland within Spokane's division. Booster club fan buses from both teams make the trip between the two cities, helping to boost attendance in both rinks. The rivalry between the cities of Spokane and Cranbrook goes back near a century, and it's a shame this game marked the last time these two will square off. Kootenay was coming off a 7-4 loss at Tri City the night before, but had led 3-2 after one before the Americans put up 4 goals in the second to pull away. The Chiefs seemed determined to not let the Ice get out to the same kind of start Saturday, as Jaret Anderson-Dolan snapped home his 8th of the season just 3:08 into the game to make it 1-0 Spokane. Rookie Jack Finley then tipped in an Egor Arbuzov shot just over 2 minutes later to give the Chiefs a 2-0 edge. Kootenay cut the lead in half on a Martin Bodak goal at 7:03, but Spokane countered with a Riley Woods power play goal at 9:04 to take a 3-1 advantage after the first. Finley would then notch his second two goal game of his rookie season with another tally at 4:34 of the second period to expand the lead to 4-1. Bodak then scored his second of the night midway through the period to cut the Chiefs lead in half at 4-2. Spokane would wrap up the scoring when Bobby Russell scored against his ex-team in the final two minutes of the period to give the Chiefs a 5-2 lead after two. Neither team would score in the third as Spokane won their third straight during the week and 5th out of their last 6 games. Eli Zummack extended his assist streak to 8 straight games, and Connor Gabruch, who had not scored a point in the first 33 games of the season, extended his points scoring streak to 4 in a row. The win enabled the Chiefs to sweep their 5 game series with Kootenay in the final meeting between the two. Spokane also gained two points on second place Portland as they lost at Everett, and gained two on 4th place Tri City, as they fell at home to Victoria. More importantly, the Chiefs seem to be finding their game entering the final month of the regular season. The team's fourth line of Finley, Gabruch and Michael King are coming into their own as an offensive threat and will make Spokane a tough opponent moving forward. The schedule will certainly get tougher as well, as the Chiefs will have three challenging contests this week. Spokane will close out their home stand as they host the last Central Division team to visit Spokane this season in Red Deer on Tuesday night. The Chiefs will then end the week on the road as they visit B.C. Division leading Vancouver on Friday and then rival Tri City on Saturday. I'll have the call on 103.5 the Game for Tuesday and Friday's games, while Saturday's game in Tri will be on 94.1 the Bear due to Gonzaga basketball. Tuesday and Saturday's games will have 6:30 pm pre-game shows with 7:05 pm puck drops, while Friday's game in Vancouver will be a 7 pm pre-game and a 7:35 pm start. Let's see if the Chiefs can keep their momentum going and we hope to see you at the rink!